It is a short 90-minute saunter up the side of the glacier to get to Everest Base Camp, the jumble of tents at the bottom of the infamous Khumbu Icefall apparent from some distance. Given the uncertain nature of glacial terrain, the path doubles back and forth past crevasses before suddenly entering the compact area of tents. This year, it is home for over 600 climbers, supporting sherpas and porters, their tents perched improbably on the ice on stone-built platforms. The risks are ever-present. A couple of days before my visit, an avalanche had swept down the Khumbu Icefall, killing one Sherpa climber and injuring two others, the snow-dust cloud reaching well into Base Camp itself. The Icefall, which moves about a metre down the hill each day, is always dangerous – and particularly unpredictable this year. The snow piled up on the forbidding slopes to North have made it more treacherous than usual – to the extent that at least one expedition leader has put a time limit on climbers getting through. If you can’t make it in time, tough – you’re back down, no climb. 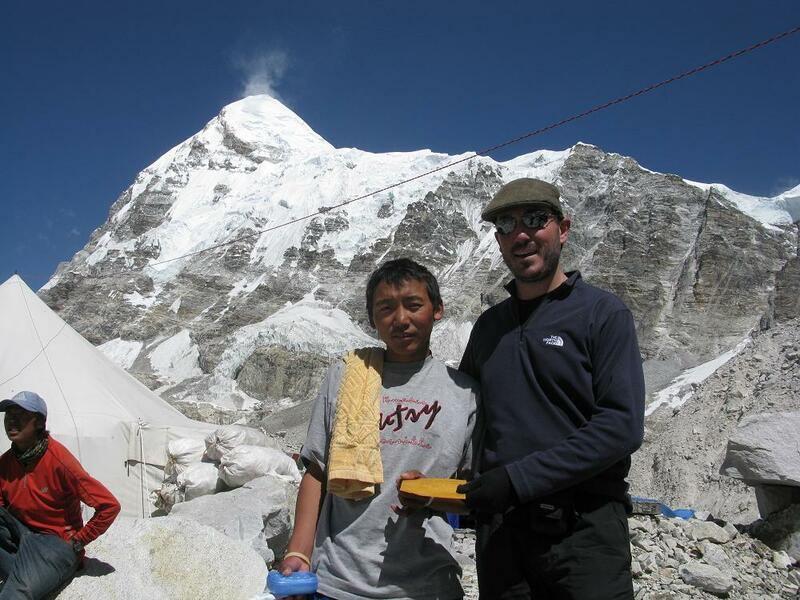 But I had work to do – 8 days earlier, across a couple of mountain ranges ot the West, I had been given a letter to deliver from a Sherpa whose son was at Base Camp. I started asking around to locate his expedition. “Alpine Ascents?” I enquired. The familiar answer – “Go straight” with a vague wave of the arm in the direction of the main camp – wasn’t particularly helpful. In fact, somewhat predictably, Alpine Ascents was the furthest possible set of expedition tents right at the top of the temporary village by the foot of the icefall. Knowing that expeditions were not always that keen on the distraction of visitors, I entered gingerly. “Errrr… I’m the postman – anyone know Nima Nuru Sherpa?” A few shouts and grunts later, and the 19-year-old Nima wandered out, toothbrush in hand. It was a great moment – in an age of instantaneous communication across continents, there’s something deeply satisfying about delivering a letter by hand over 30 miles and eight days. After he had devoured the letter, I sat quietly drinking tea with Nima for half an hour. He must have offered me more tea about very 30 seconds. I will stay in touch with him. 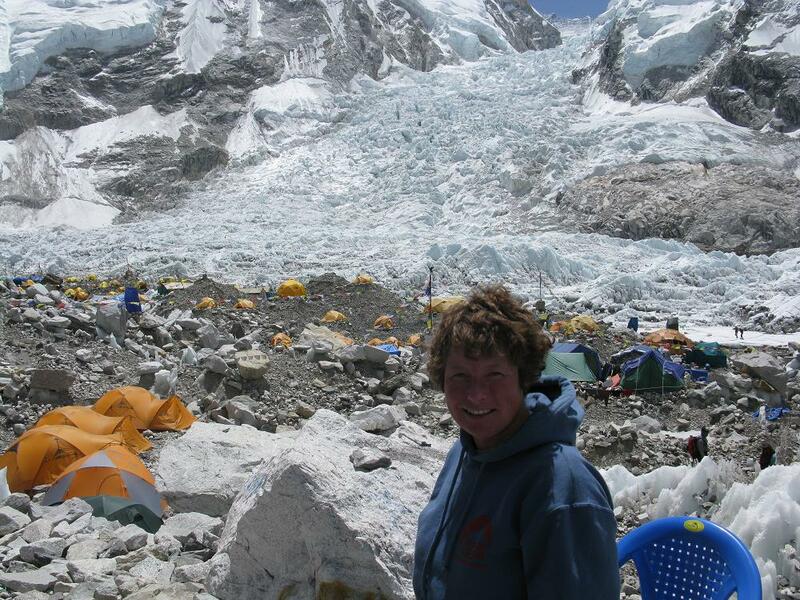 I spent a further couple of hours at Base camp, chatting with the leader of the Jagged Globe expedition (Adele, pictured in front of the Icefall, with the ominous hanging ice on the slopes to the left/North) and one of the climbers, Doug (Everest will complete the “Seven Summits” for him). I did a climbing course with Jagged Globe in the Alps in 2006. Adele was, amusingly, recovering from a massive party put on my the Kazakhstani Expedition the night before. I also managed to enjoy the incredible apple pie in the Base Camp Bakery (set up by a climber-Sherpa Steven Dawa Sherpa – all the profits go towards an initiative to remove plastic waste from Base Camp) before eventually dragging myself away from this fascinating human drama. As I returned to Gorak Shep, heavy snow started to close in. It would snow for the next three days. Summit attempts this year have already been postponed once (orignally May 10th), and the snows are threatening to do so again. As I write, many expeditions have set off with the aim of summitting on or around the 20th. You can read about their progress here. With so many expeditions, the chances of queues for the top along the final stages is high. 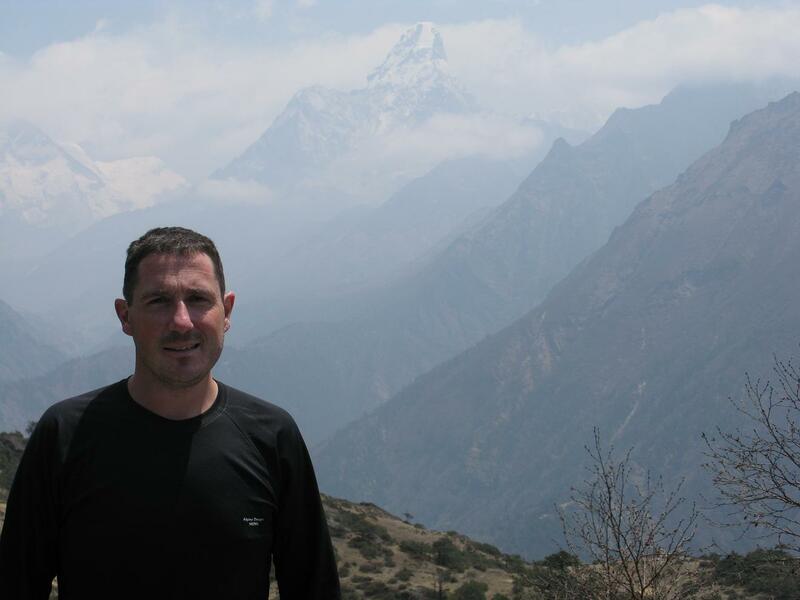 After a quick wander up the 5600m peak Kala Pittar, I reluctantly started heading back down the Khumbu valley. 4 days of sickness (plus the deteriorating weather) put paid to my plans to walk over a third pass to the fifth valley. As I descended, a series of strange incidences occurred which only made sense later. A Sherpa complaining of severe kidney pain in Gorak Shep; an expedition leader passed me running down from Base Camp to the medical camp at Pheriche and back (2 hours round trip); a higher-than-usual number of helicopters buzzing up and down the valley. The full story is quite remarkable, and very sad. Essentially a bad batch of moonshine booze from Kathmandu (methanol masquerading as whisky) killed one Sherpa cook and severely injured another. The activity I had witnessed was an amazing (successful) 48-hour battle to save the second Sherpa. It is recorded, by the climber whose cook he was, in a compelling blog here. The doctors had to innovate above and beyond normal practice, eventually (bizarrely) putting him on an alcohol drip, to combat the methanol. Incredible. Within two hard days of walking through the snow, I was back in Namche Bazaar. I returned to the hut that I had started from. I was happily explaining my route to the owner and casually mentioned the Japanese climbers that I had bonded with over the local rice-beer Chang 15 days earlier. I was shocked to hear that 2 of them had been killed in their attempt to climb Kawande, their rope being cut by a falling rock as they ascended a ridge. It was a final reminder of how dangerous proper climbing in this region can be. I returned, bearded, to Kathmandu for the inevitable night out in Thamel, and reflected on a rewarding, fascinating and sobering 20 days. Taking the path less trodden across the passes) had given me a broader sense of the region and it’s culture than I could have hoped for; and travelling without a guide or a porter (I carried all my own gear) increased the physical challenge, and gave me a very liberating sense of freedom. Finally, the trek served as Phase 2 of my unintentional weight loss programme (Phase 1 being qualifying as a Yoga Teacher). Getting ill at altitude is a fine way to shed the pounds (though probably not medically recommended). While not quite a rake yet, I definitely am erring on the slender side for the first time in a few years. I leave for Tibet, overland, on Tuesday; with only a 15-day one-man “group” visa for Tibet, I then have the challenge of entering China via the Lhasa-Qinghai railway, and trying to extend my visa – apparently not as easy as it sounds. It’s not often that you get the chance to connect to the Internet at 3500m. I am in Namche Bazaar, the stepping-off point for Everest Base Camp Trek. Most people spend a couple of nights here for acclimatization, hence the rather smart internet facilities I am now sitting in. I flew into Lukla’s aptly named STOL (Short Take Off and Landing) airstrip on Saturday, the first plane to arrive at 7am. The benefits of an early start were immediately apparent, as I set off immediately on the two-day trek to Namche. From Lukla, the path snakes up through villages and tea-houses, past pine trees and plentiful rhododendrons, and crossing the occasional steel suspension bridge over rushing green glacial water. It wasn’t long before I met the first group of porters coming down with improbably large and precariously balanced loads. The way they carry these is extraordinary – rather than using rucksack style shoulder straps, the entire weight is carried on a single band looped across the forehead, with a forward-leaning stance presumably ensuring that the entire spine is used/damaged rather than just a few vertebrae. It is an amazing sight. They are frequently carrying 2-3 100 litre kit bags, fully loaded, and strapped together. Others carry bundles of thick planks of wood or large boulders for construction work, held in specially designed carrying contraptions. But you don’t want to stand amazed for too long – there is no chance of the porters giving way, and at the pace they are moving, flattening yourself against the shrubs on the inside of the path is the wisest policy. The load-carrying Yaks (called Dzubjoks or Dzongios) are equally impervious to the weak-kneed wobbles of terrified trekkers. Yesterday I got my first glimpse of the highest point on the planet. I had to stop myself for a moment to remind myself that I was actually here, and savour the extraordinary sight of Everest, flanked by the equally impressive Lhotse and Nuptse. This morning Everest itself was in cloud for the first time in a few days – hence in the picture, it is the aggressive peak of Ama Dablam to the South that is in the background. There is a wide variety of trekkers here, from the late middle-aged Japanese trekking not much further than Namche for a glimpse of Everest to one group of school-children having the time of their lives. And the occasional runner. Yes, runner. Some are slightly clueless – yesterday, I was very surprised to see again a French Swiss guy who I had met on the India-Nepal border last week. He was on his way down at a rapid pace. It didn’t make any sense… he looked fit, but with acclimatization there was no way he could have been all the way to Base Camp and back. I quizzed him on why he was descending. When he told me he had got to Namche and was surprised that he couldn’t use his debit card, all my sympathy evaporated. The rapid pace was due to the speed of his (understandably furious) unpaid porter-guide. The vast majority of people here are on the standard route to Everest Base Camp, which you can see on this map – the route goes North East from Namche before turning North to finally getting to Gorak Shep. A couple of friendly Nepalis guiding other parties have helped me to establish a longer, more esoteric and exciting (but perfectly safe) route which goes West, in the opposite direction. For the map-minded among you, I will be going across to and up the Bhote valley, across the Rhenjo La pass (La means “pass”) to the Gyoko Valley, across the Tsho La to Gorak Shep, and finally down to Chukkung, before returning to Namche. The highest point on the passes will be about 5450m or 18,000 feet. I will be back in Namche in about a fortnight’s time and will post again then. The last three days in Kathmandu have been dedicated to pulling together a rag-bag of gear before leaving tomorrow morning for Everest Base Camp. (Exploring the city properly will have to wait – all being well, I will have 5 days in Kathmandu before leaving for Tibet). 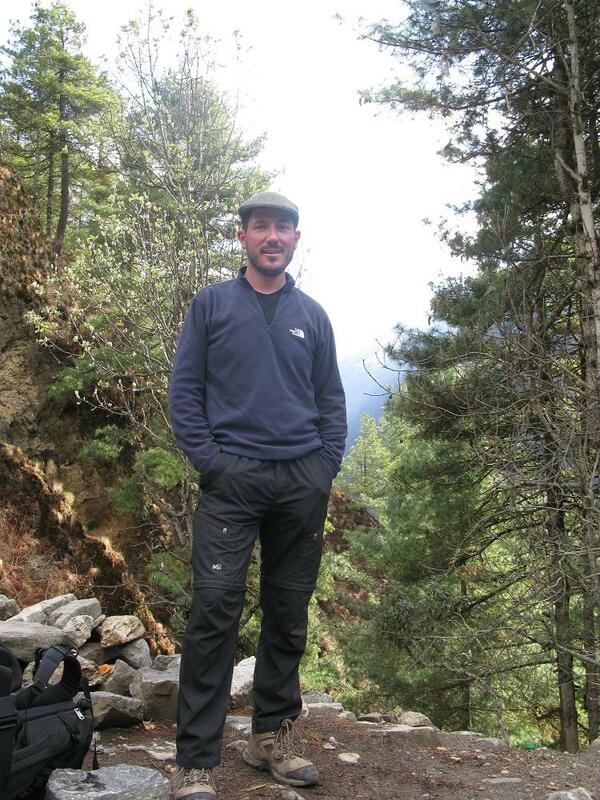 My flat cap, as always, travels with me in a nod to climbers from a not-so-distant age. For other kit, a friend tipped me the wink that “Shona’s Alpine Rental” was the sensible choice. Run by a Brummie called Andy and his (Nepalese) wife Shona, these two have built a reputation for honesty and straightforwardness, in a town of sharpsters selling amazingly accurate copies of North Face and other branded gear. My flight to Lukla (the staging post for the trek to Everest Base Camp) leaves early in the morning to avoid the winds that gather later in the day. With ample time for acclimatisation, I should reach the base camp in 8 or 9 days time. It will be a fascinating time of the year to be there, with all the climbing parties getting close to the summit. The exact timing of summit attempts will be dependent on the increasingly mercurial gulf stream. I may even meet these enterprising cricketers on the way down, who just completed a cricket game at 5164m, close to Base Camp, yesterday. You can track the progress of all the climbing parties attempting Everest this year at this remarkable website, which keeps a live check on where they all are. I will return to Kathmandu on or around 15 May. Long absence from posting, due to silly work pressures. Anyway, 2 weeks in the Alps in August resulted in completion of the Haute Route (across the glaciers, Chamonix to Zermatt), and summitting Mont Blanc, from the “esoteric” Italian Route (14 hours). Pic below is me, Rob, and Brydie on the summit, 8.45am. More to come.